Simply Put - Our Methods and Services Provide a Better and Longer Lasting Clean. 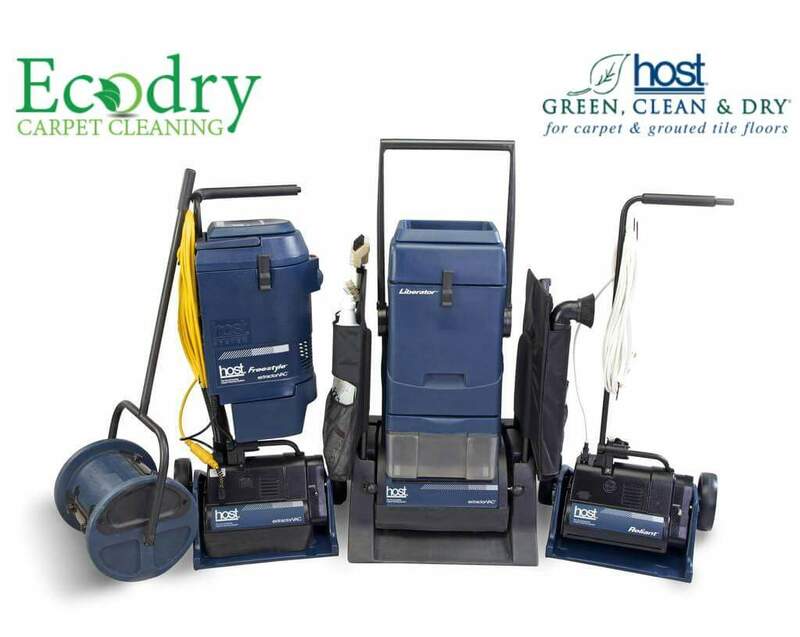 Why HOST® Dry Carpet Products? We already know how many benefits there are by using HOST®. If you don't have a clue as to how many, read our carpet cleaning benefits page. First, everything we use is natural, biodegradable and non-toxic to people and pets. Our cleaning process is made up of an all-natural blend of plant-based ingredients, water bonds, cleaning detergents and wetting agents. As our portable machine vacuums and brushes the carpet, the dry-particles perform a reaction that easily dissolves dirt, grime and stains. What Is HOST® Dry Extraction Cleaning? This is a great video from the manufacture. Learn why it's the most certified floor cleaning system in the world. First Step - Vacuuming the Area. To get the best results, we need start with a cleaner surface. That is why we vacuum the area with our machine, to remove any dry soil. Second Step - Apply HOST® Dry Cleaner. Depending on the area, additional Pre-Clean treatment might be needed. This is perfect for high traffic areas, stubborn or greasy spots. Applying this treatment loosens the chemical bonds making it easier to lift and clean. Third Step - Using Machine. The machine that will be in use, is a DRY Extraction Cleaner. It's a complete system that holds Advanced Formula HOST® Sponges and the cleaning solutions. These sponges are soft, all-natural and moistened with water, detergent and a proprietary plant-based cleaning solvent. Similar to wiping powder with a wet towette in the kithcen. Our system intelligently controls a precise ammount of cleaning liquids, so dissolved dirt doesn’t run underneath the carpet lining. We use a precise passing method that ensures every part of the area becomes in contact with our brushes. *Depending on the area, we may have to apply additional HOST® dry products and machine brush again. While stubborn spots and areas are common. This is where we really separate ourselves from the rest of the carpet cleaners that use a truck-mounted system. Going over an area again with a truck-mounted system will over-wet and likely to stretch the carpet with the suction. Our DRY Extraction System will never over-wet the area or even loosen your carpet off the sub-floor. Final Step - Vacuuming. Our final step, is to vacuum the area one last time. This ensures the carpet is clean, dry and ready to walk barefooted. If you see small amounts of cleaner left behind, don't worry because it is completely harmless. Don't Have Carpet? See It to Believe It! Our DRY Extraction Cleaning also does wonders on hard and textured floors i.e. LVT, ceramic tile, quarry tile, granite, rubber and so much more. Even Area Rugs. With so many delicate materials and fibers, we are capable of delivering great results. It is common to see damaged rugs after using a water-soak method or over-applying a harsh acidic solution directly on the fibers. Our DRY Extraction method is perfect for even the most delicate rugs. Did you know? The entire HOST® systems perfectly falls under the rigorous EPA guidelines (EPA Establishment No. 074202-WI-001). Brands, apparatuses, and procedures that advertise the removal of dust mites, mold and allergens need to be approved by the jurisdiction of the EPA and must be made in an EPA registered facility. • Mold Spores by 85%. Give us a call or submit an easy form by selecting your choice below.